With a loaded pitching staff and a starting nine whose salaries total more than a lot of small market teams, this season should have been a walk in the park for the New York Yankees, right? Only if Dr. James Andrews lives right across the street from Yankee Stadium. Anyone looking at the Yankee pitching staff now probably doesn't know if they are looking at what was thought to be a recipe for success -- or a game of Operation. Coming into the season, New York's pitching staff was believed to be a team strength. But as the All-Star break looms, the Yankees pitchers have become more of a physical therapist's dream than anything else. 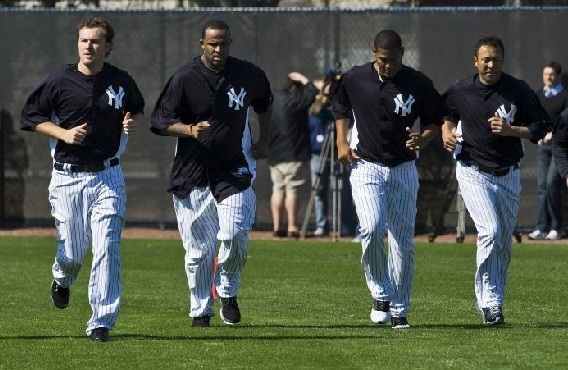 Yankee officials entered camp elated about the pitching depth. The rotation was supposed to be seven-deep, and the bullpen was supposed to be the best in the majors. In February, the rotation was supposed to be headlined by All-Star C.C. Sabathia, followed by newly acquired stud Michael Pineda. Veteran free agent signing Hideki Kuroda was supposed to go after and the rotation was to be rounded out by some combination of Phil Hughes, Freddy Garcia, and Ivan Nova. The Yankees also had the luxury of knowing that Andy Pettitte was coming out of retirement and would add yet another arm to the rotation. The bullpen had a sure-fire recipe for success with the return of the So-Ro-Mo trio to end games. The plan was even on a bad day, the starters could give at least six innings, and manager Joe Girardi could coast to the finish line by throwing former All-Star closer Rafael Soriano in the seventh, closer in waiting David Robinson in the eighth, and future Hall-of-Famer Mariano Rivera in the ninth. Not to mention, once highly touted Joba Chamberlain was expected to be ready to join the All-Star pen by mid-season. Now the weather has warmed up, the Yanks are out of Florida -- and it's a whole new ballgame in New York. Yankee pitchers have been going down one by one. The disabled list would make most managers cry themselves to sleep and have most general managers scrambling to make a blockbuster deal to save the season. However, the Yankee front office has been playing it cool. In April, when it was discovered that Pineda was not going to be able to pitch, he was quickly shut down. Many project him as a future ace, so the Yanks were not taking any chances. In fact, he's not expected to suit up again until the next time the Yankees play a game with palm trees beyond the outfield wall. Their depth made that injury easy to swallow though, because there were still five pitchers to fill the rotation and another on the way. Everyone thought it was worse case scenario when closer Mariano Rivera went down for the season with a freak ACL injury. Is Robertson ready for the ninth? Will Rafael Soriano be consistent? Who will pitch the seventh? But as the entire world panicked, Yankee brass remained calm. Bad turned to worse when David Robertson went down with an injury. With that forcing Soriano to close, many thought that would force the Yankees to make moves. Again, the front office stayed true to who they had. An assortment of Joe Schmos turned in clutch performance after clutch performance to help the team stay afloat in the loaded American League East. It all seemed good as a starting rotation of Sabathia, Pettitte, Kuroda, Nova, and Hughes turned in quality starts night-in and night-out to help the Yankees surge into first in the division. Robertson returned and the rest of the bullpen pitched solid. Everything looked good in Yankee Nation and the "Evil Empire" looked to be poised to take the American League by storm once again. It seemed like the Bronx Bombers were on cruise control, winning with solid pitching instead of the traditional out slugging everyone -- until the injury bug bit again. Now, ace C.C. Sabathia and reliable veteran Andy Pettitte will take their turn on the DL rotation. Sabathia's turn looks to be less severe. It is expected that he will only miss two starts and be ready to go after the All-Star break. Pettitte, on the other hand, looks to be out for substantially longer. A broken fibula has doctors saying eight to ten weeks; best case scenario. Many Yankee officials do not expect him back until late August. For the first time all season, the Yankees are shopping. For now, the plan is to use rookie Adam Warren to fill one hole and veteran Freddy Garcia to fill another. After a stint in the majors used primarily as a long reliever, David Phelps was sent down to the minors to have his pitch count increased in case Warren or Garcia are unable to shoulder their load. If plan A fails, look for the Yankees to toy with the idea of landing a veteran arm such as Matt Garza or Ryan Dempster of the Cubs -- or a younger arm like Twins starter Francisco Liriano. Just don't expect to see future aces Dellin Betances or Manny Banuelos making appearances before September. GM Brian Cashman is set on keeping them in Triple-A to get more experience before they get called up. This year, injuries are forcing the Yankees to do things a little differently. Instead of winning with a pitching staff of All-Stars, award winners and Hall of Famers -- they are winning with a group of young arms, traveled vets and relative unknowns. So if you never heard of half the guys who are currently coming out of the pen, it's okay Yankee fans. Neither has the rest of the world. Gotta give Girardi and Cashman credit for keeping the Yanks in contention with all the injuries they've had to deal with. A lesser team would be ten games or more out by now. Pretty much what I've come to expect from the Yankees though. No excuses and continued success.